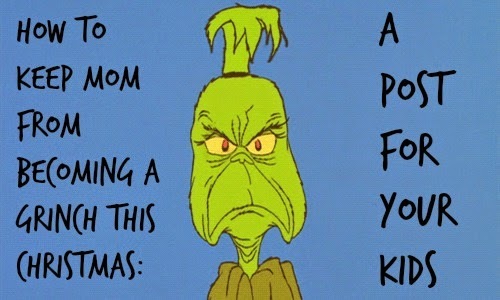 Are you guilty of under-appreciating the mom in your life this Christmas season? There’s still time to turn it around and make mom’s heart grow 3 sizes by Christmas Day! 1. Assist with Christmas decorations. She’s decorating to help her family feel the Christmas spirit and it sure would increase that spirit if mom had some happy helpers. You could even make some decorations for her to proudly display! 2. Help her gather and wrap presents. Christmas shopping can be fun, but doing ALL the Christmas shopping and wrapping ALL the presents can be a little exhausting. Ask her what she needs help with and try to smile while you’re helping. 3. Bump up the Ps and Qs. Manners make all the difference this time of year. Mom works hard to keep her family happy, especially around Christmas. Make sure you are extra polite and extra helpful. 4. Be grateful and appreciative. Whining doesn’t help anyone and it’s super annoying. Showing mom some extra love and sweetness could go a long way in the present department. 5. Be a Christmas spirit advocate. Mom works hard to keep the magic of the Christmas season alive. Don’t ruin it by making unfounded accusations about the existence of Santa. 6. Support Christmas traditions. If mom wants to see Christmas lights or go caroling, do it with a smile on your face and a song in your heart. It will be so helpful and mean the world to her. Once you’ve followed these simple steps you’ll be able to see your mom’s face glow with love and appreciation. Then get ready to have the best Christmas of your life!